Channel menswear flair with a chunkier version of the classic loafer. Get an androgynous look with tapered high waist trousers, culottes or mannish silhouettes. Bring a feminine touch by introducing sorbet shades like mint and blush. Get style in a hurry by teaming classic black loafers with a pair of cuffed skinnies and an over-coat for good measure. Stripes and pastels pop with this look or go super casual with a plain white tee and a pair of sunnies. 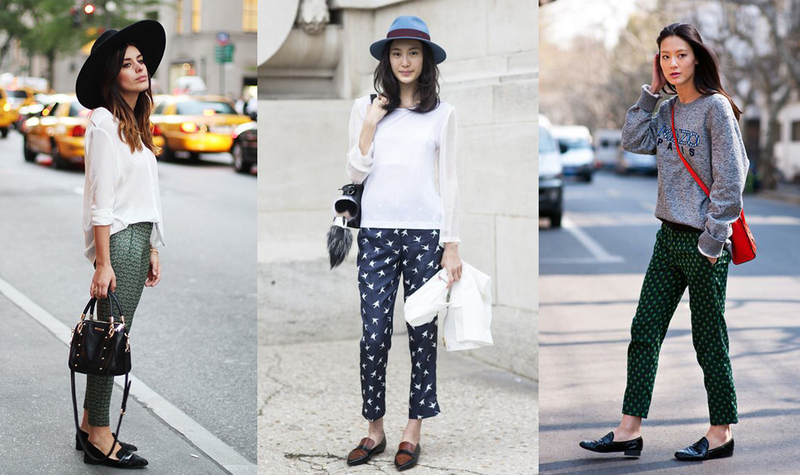 Loafers and patterns go hand-in-hand. Team your tasselled moccasins with patterned trousers and layered jackets. Alternatively opt for a patterned shirt and keep the bottoms plain. Pastels are huge and we are loving the range of loafers in this palette. Embrace the look and wear all your pastels at once! Get a style sugar rush with pants, coats and tops in the prettiest sherbet shades. Take your cue from loafer lover Alexa Chung with the slipper style loafer. Get comfy in this laid back and practical shoe with layered jerseys, cashmere sweaters and your comfiest denim. We are crushing on this versatile and stylish trend at the moment! Loafers add old school charm to your wardrobe and tend to go with every outfit. Wear them how you want and create your own fashion story!